Voodoo / Mojo, what ever you want to call it, the Cream-Tone has it! The Cream-Tone is a blues players dream come true with a wonderful almost transparent tone through to a slight midrange bump for being heard in the mix. Strat's take on the "Texas Tone" while Tele's can pull off open string runs with sparking clarity. Our aim was to develop a pedal geared towards vintage tone freaks. Each pedal is hand-made using the finest quality components and tested to ensure that it preserves the guitars natural tone. We have been asked by a few "175" and "335" players for a "less drive" mod, so we added a couple of switches inside, to allow you to customise your G2D Cream-Tone to your guitar and playing style. Click here to find out more. 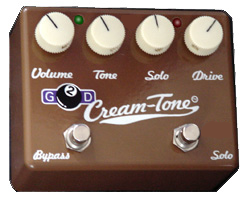 The Cream-Tone features true bypass as well as a Solo switch for volume boost when you are soloing. Volume sets the balance between your clean sound and the pedals sound. Tone is our unique design, it adds fullness to single coils and has the ability to make humbuckers sing. Solo sets the amount of volume boost and adds warmth without adding extra drive. Drive ranges from clean* to a singing mild overdrive, without losing string definition or pickup charactor. (*depends on internal switch settings). Green light on, in Blues mode. Red light on, in Solo mode with a volume boost. 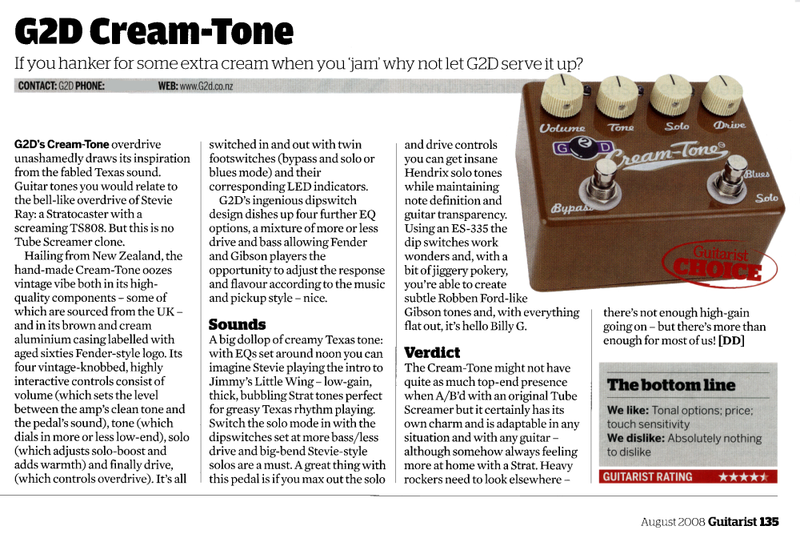 To read more about the "Cream-Tone", click on the article from the NZ Musician magazine. Click here to read the review. OK... Lets hear it ! Oops... Out of stock. Sorry :-( Email us for an update. 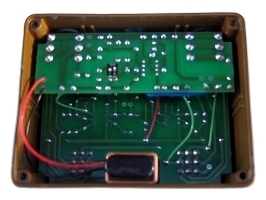 If you are not happy with your G2D Guitar Pedal, then email us within 14 days and return the pedal in its original box for a refund. This offer excludes shipping and customs charges.